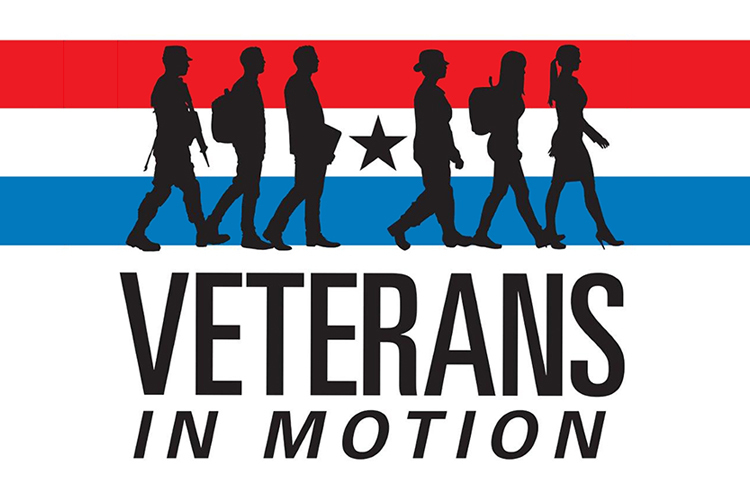 MTSU “Veterans in Motion” speaking participant Mike Krause and attendee Pam Russell served in the military and now lead productive lives in their careers and communities. Krause, Tennessee Higher Education Commission executive director, and Russell, human resources director for the city of Murfreesboro, are personal examples of the narrative MTSU’s Keith M. Huberspeaks of regarding veterans. 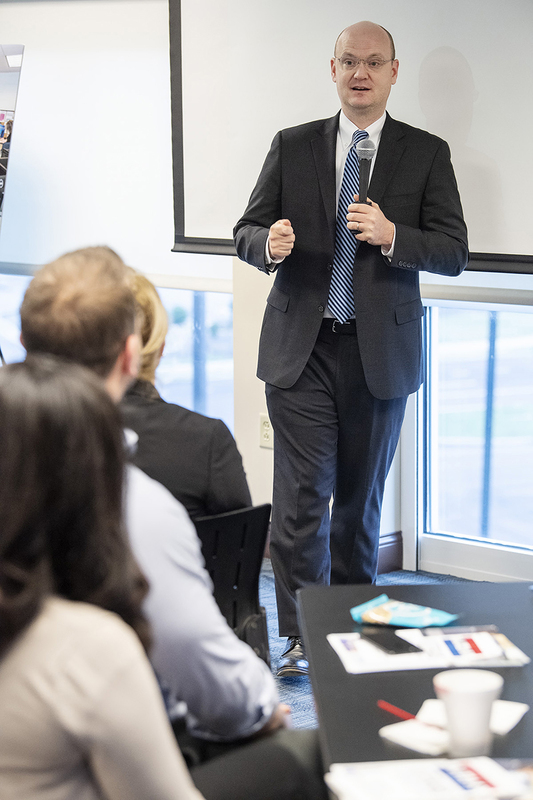 The Huber-led gathering Thursday (Jan. 24) at the Rutherford County Chamber of Chamber of Commerce and Visitors Bureau helped those attending learn about opportunities and pathways veterans can pursue following the conclusion of their military service. The VA, Bridgestone, Waffle House, FirstBank and Rutherford County government representatives were among those attending. Krause served eight years in the U.S. Army and Tennessee Army National Guard, completing three combat tours with the 101stAirborne Division and was awarded the Bronze Star Medal during Operation Iraqi Freedom. Craig Tindall, Murfreesboro city manager, said every time he talks to Huber or Miller he is “amazed at the amount of resources” available at the center, which is located on the first floor of Keathley University Center with additional resources in the Transition Home Office (to help veterans and others find work) on the third floor of KUC. Jennifer Vedral-Baron, VA-Tennessee Valley Health Services director overseeing the Nashville and Murfreesboro VAs and other clinics in Middle Tennessee, shared a video regarding “Whole Health,” a redesign of health care implemented by the VA.
“Many veterans are embarking on this health journey,” said Vedral-Baron, who added that yoga, walking, swimming chiropractic care, acupuncture and smoking cessation are part of the new initiative. 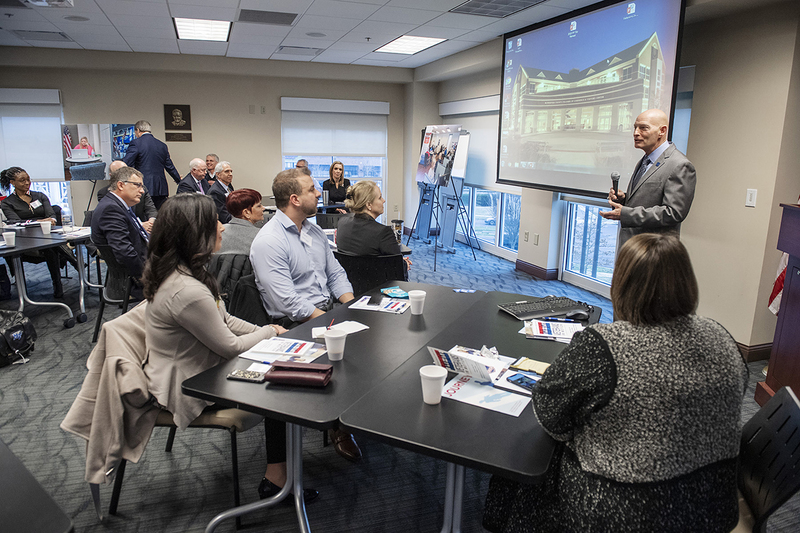 Miller also presented a short video showing student veterans talking about the advantages and opportunities the Daniels Center offers and shared the center’s mission. Rutherford County Mayor Bill Ketron and Chamber President Paul Latture were other speakers at the event. Both offered insight into opportunities and resources available to veterans. 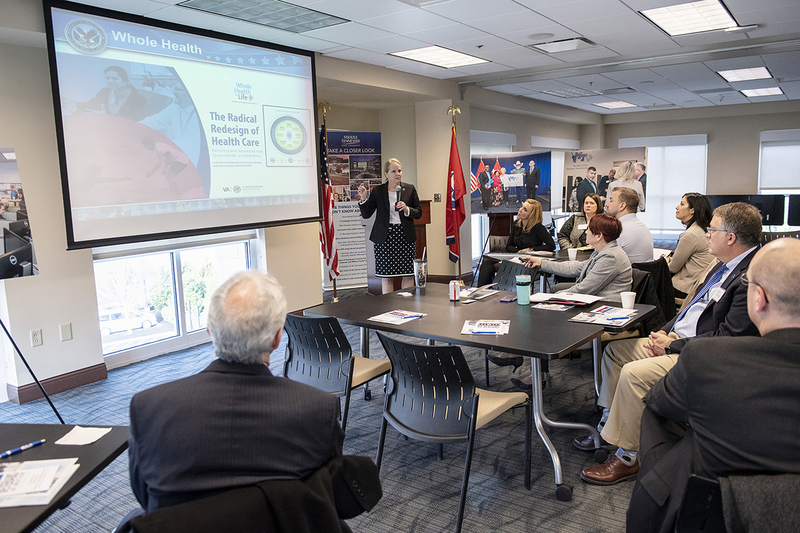 MTSU Provost Mark Byrnes and Suzanne Jene, deputy health system director at the Tennessee Valley Healthcare System, were among the attendees. MTSU’s student veteran population is approximately 1,000, which includes family members. They receive strong support from the Daniels Veterans Center, which is the largest and most comprehensive veterans center on any Tennessee higher education campus.